What a wonderful, busy weekend we had! We were in Lowell, MA for my daughter's skating competition. Her synchronized team, the National Blades, traveled to the 2011 Colonial Classic and skated an amazing program to finish with a 4th place medal! This is such an an awesome accomplishment considering not only the high level of competition that was there, but all the difficulties her team has had to overcome this year. They just did a fantastic job and I couldn't be prouder of them! So, after our 10 hour drive home last night, I'm a bit draggy this morning - to say the least! Good thing I had this card already loaded up to share with you! 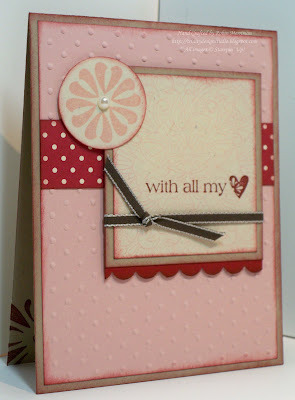 This card uses the With All My Heart stamp set and the Fine Flourish single stamp. My Big Shot and the Polka Dot embossing folder and a few punches add dimension and special touches to make it a card that anyone would love to receive. I hope you all have a wonderful day today! I'm looking at a busy, busy day as I do all my packing and prep to leave for Leadership Conference tomorrow! Wish me luck! Beautiful!!!! And tell Emma Congrats from me!!! I missed watching her skate but was thinking of her and her team!!! Very sweet card, love the quick and cute! Hi Robin. Glad to hear that Emma and her team did so well...congratulations! Hope you have a good trip to Leadership...please check with the airport before you leave tomorrow a.m. as your flight may be cancelled or delayed...Tennessee got about 8 inches of snow today!